Quite a while ago, I briefly reported on the spectacular Mars Science Laboratory mission that is currently under way. As you are probably aware, the Curiosity rover has now safely landed, and is already exploring the Red Planet. In this article, I want to tell you about the spectacular way in which the rover was put down on the surface. For previous Mars rovers like Sojourner, Spirit, and Opportunity, the “delivery method” of choice was to slow them down using parachutes and rocket engines, and then just drop them the final few meters, using airbags to cushion the impact. Sojourner, for example, bounced at least 15 times, the first bounce being 15 meters high. All three landings succeeded, and Opportunity, which landed in 2004, is still active at the time of writing. So the parachute / rockets / airbags technique is certainly proven technology. But for Curiosity, which is the size of a small car, using airbags was not an option, since it is too heavy for that. As an alternative, a sky crane approach was used. After being slowed down by the parachute, the descent was further slowed to a hover by rocket engines. The rover was then actually lowered on cables and put down gently on the surface, on its wheels and ready to rove. The following spectacular video, made by a downward facing camera on the bottom of the rover, shows the last two-and-a-half minutes of the landing sequence. The audio track contains comments from mission control. 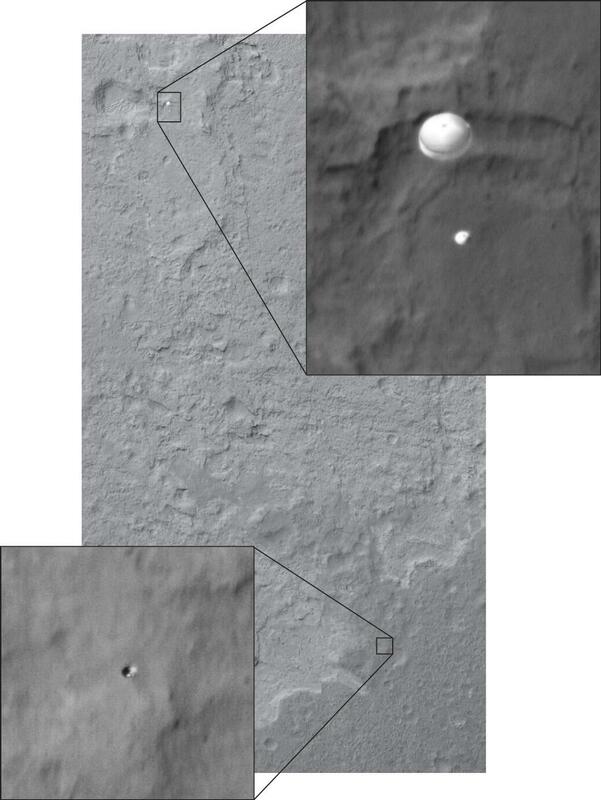 Below is a really cool photo that shows the parachute with the lander during the landing phase. It is a truly amazing fact in itself that there is actually an orbiter (the Mars Reconnaissance Orbiter in this case) available to make pictures like this in the first place. Click the photo for a larger version of it. The second object, near the bottom of the image, is the heat shield that was dropped after the deployment of the parachute. It is actually still in free fall in this photo. You can follow the daily progress of the Curiosity rover very well on the MSL homepage. Have a look!